Transform your most treasured photos into magnificent masterpieces to be cherished for years to come. Magnificent Christmas gifts for him this holiday season, these high quality thick wraps will transform your most cherished photographs into magnificent masterpieces. Choose from a wide variety of unique styles, fabulous color options and varying sizes to create creative, one of a kind Christmas gifts that the man in your life is certain to treasure for years to come. Select a new, 16×20 premium canvas wrap to display your favorite photo and receive a 2 year warranty for your museum-quality thick wrap. 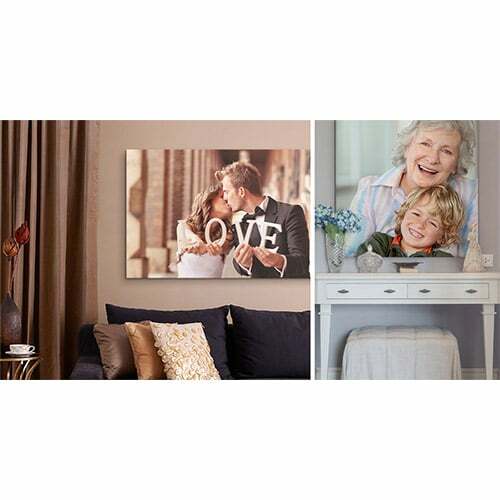 This 1 ¼ inch canvas is warp-resistant and features a premium, high quality black mat-board backing to preserve your favorite piece. That special man in your life can use the included hardware to hang his gift and enhance any wall in his home or office, or add this unique print to any shelf or display case as an attention-grabbing accessory. The traditional gallery wrap features impressive, museum-quality canvas, a classic styled wooden frame, and mounting hardware to create a unique Christmas gift for him that is certain to be appreciated by friends and family. This looks like a really great product! My sister took a picture of my husband and I about 3 years ago. It was a candid photo and captured our personalities perfectly. I would like to get that photo printed on one of these. Perfect!